During this past weekend I had a holiday card making class. So the next 5 post to come will be the cards we created during that class. This one is a very easy card which can be used for other occasions as well, especially as a masculine card! This is one of my favorite sets, Lovely as a Tree. It's just so versatile and "lovely." Enjoy! Cut standard card in Chocolate Chip. Stamp horizontal trees stamp in Choc. Chip ink on the bottom of the card front. Cut Very Vanilla as 3.25 x 4.5. Then cut Close to Cocoa piece 1/8 inch shorter. Use the Linen stamp in Close to Cocoa to cover the Close to Cocoa piece of paper. Stamp tree images at the bottom of the Close to Cocoa cardstock, but in Chocolate Chip Classic Ink. Stamp images of the pine cones in the upper corners, also in Chocolate Chip ink and on the piece of paper for the greeting. 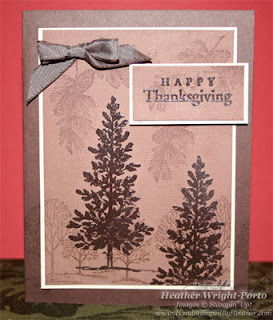 Now, using Chocolate Chip Craft Ink, stamp 2 large pine trees and the greeting. Then cover in Clear Embossing powder and heat. It looks GREAT. Tie and adhere bow in upper left corner and adhere with Mini Glue Dot. Adhere and assemble the rest of the card with SNAIL adhesive and then with Stampin' Dimensionals on the greeting only. Last but not least, remember you can always shop online! Click the button below and then click SHOP NOW from my Stampin' Up! website. What a lovely look for such a classic favorite! This is one of the best sets SU has ever designed! Love the use of embossing and the ribbon is so sweet. Great card! Beautiful in the monochromatic look!! I never tire of this set. Lovely card, Heather!